I made these no bake energy bites this past Sunday and oh my stars they are delicious. No oven required, just a couple bowls and some sticky fingers and you’re on your way to delicious better-for-you snacks than a lot of the prepackaged granola bars out there. I love these No Bake Sweet Salty Energy Bites because they are easy (a perennial win), they keep well, and they’re SO customizable. If you don’t like sunbutter, then you can easily substitute any other nut butter – almond, peanut, cashew – whatever floats your boat, really. Swap the cranberries out for another dried fruit, change walnuts for pecans. Changing the flavor of these little guys is seriously as simple as taking a peek inside the pantry. Since they’re portable and truly energy-packed, I will DEFINITELY be taking these on my next adventure into the woods with The Fitness Pixie as we spend the summer getting fit and attempting to wear out the indomitable Sophie. Stay tuned, because I’ll be getting my body ready for long hikes with The Fitness Pixie’s Squat Challenge! **Note: speaking of fangirling, I got a notification that the newest Mercy Thompson novel is out this week and there goes my productivity and normal sleep schedule forever. 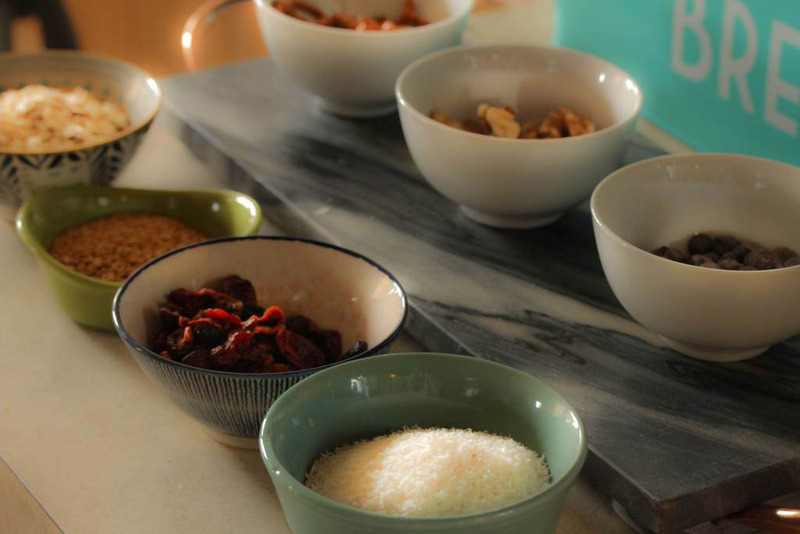 Sweet, salty, portable snacks with ingredients you can pronounce. Make these no bake energy bits for a healthier alternative to store-bought granola bars. In a large mixing bowl, mix together the dry ingredients: chocolate chips, cranberries, pretzels, walnuts, rolled oats, dessicated coconut and ground flaxseed. 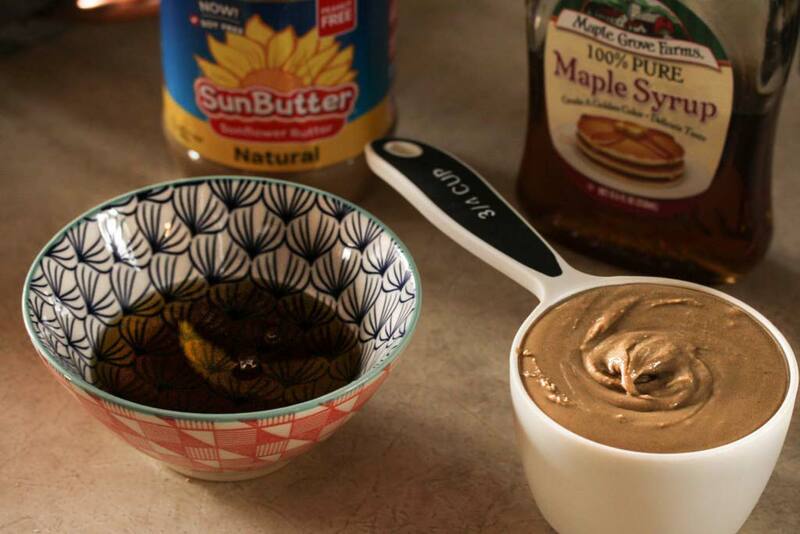 In a separate bowl, combine maple syrup and sunflower seed butter and stir to combine, using a spatula or small spoon. Combine the wet ingredients with the dry ingredients and combine. You can use a sturdy spatula for this, or be like me, and just use your hands. So squishy! Once mixture is well combined, begin pinching off pieces of your “dough” and rolling into balls between your palms. Place in a sealed container. These energy bites keep for 2 weeks in the fridge, and it’s great to toss a couple in a plastic zipper bag and take with you on the go when you’re out running errands, camping, hiking, or biking. If you want to make these lower calorie, make them smaller, or play around with substitutions. They're so easy to customize! Nutrition info has been calculated based on a yield of 24 energy bites. Look at those tasty little bowls of yum! First Measure out all your dry ingredients: rolled oats, dessicated coconut, flax seed, dried cranberries, walnuts, chocolate chips and pretzels. Second, you can buy flax seed that’s already been ground for you, but I find that ground flaxseed goes rancid more quickly than the whole seeds. Because of this, I avoid rancid flax by grinding my own when I need to in a plain ol’ electric coffee grinder. Next, measure your maple syrup and your nut butter, and stir together in a bowl. Then add your wet ingredients to your dry ingredients and mix up with a sturdy spatula or, be messy like me and just use your hands. Finally, once well combined, pinch off pieces and shape them into balls by rolling between your palms. Since these are made with sunbutter, they can be a good alternative for anyone with peanut allergies. These will store in a sealed container in the refrigerator for around 2 weeks. If you want these to have fewer calories, make your bites smaller. For this recipe, I ended up with about 24 energy bites.